The significant and prolonged drop in oil prices since mid-2014 has changed the fortunes of many energy-exporting nations around the world. This applies particularly to countries of the Middle East and Central Asia, because these regions are home to 11 of the world’s top 20 energy exporters. Budgets have generally turned from surpluses to large deficits (Chart 1), growth has slowed, and financial stability risks have increased. 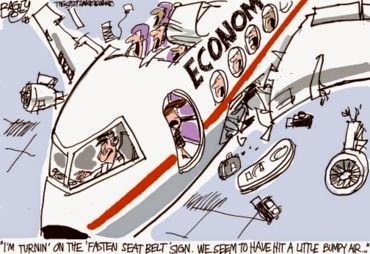 In such a challenging environment, a policy of “business as usual” will not suffice—policymakers will need to adopt significant measures to put public budgets on a sounder footing, address risks to liquidity and the quality of assets in the financial sector, and improve growth prospects. This will be a difficult long-term process, but the good news is that many countries have made a strong start, especially in terms of budget policies. In the early stages of the oil price decline, most countries appropriately used their savings to cope with the shortfall in oil revenues. 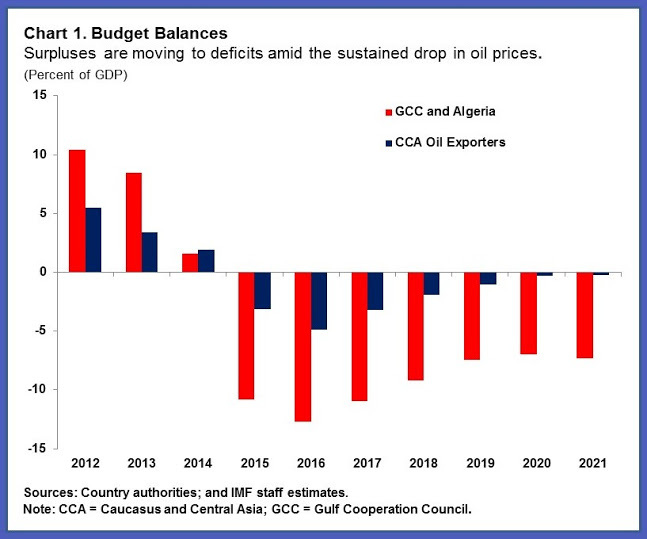 As it became clear that the oil price decline would persist, oil exporters made significant spending cuts, an obvious area to target since public expenditures had ballooned during the oil-price boom. The budget plans for 2016 indicate that deficit-reduction efforts will deepen further, with sizable adjustment measures planned especially in Oman, Qatar, and Saudi Arabia. Countries have generally aimed for savings in both current and investment expenditures. Cross-country evidence suggests that reviewing both spending categories is sensible—for instance, the Gulf countries, Algeria, and Central Asian oil exporters all have higher capital expenditure levels than their emerging market counterparts (Chart 2). 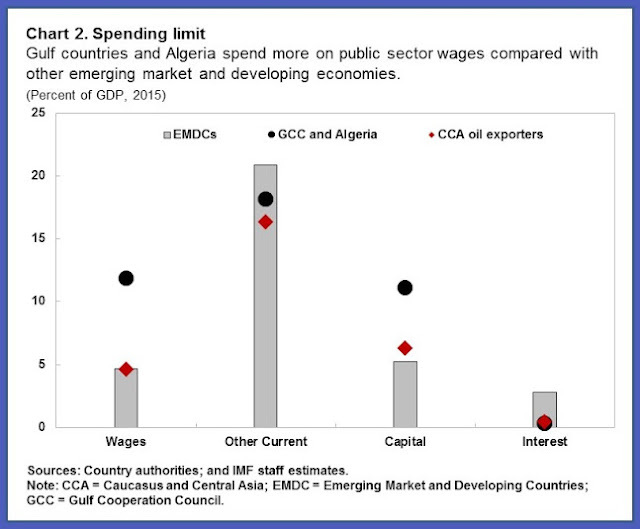 The Gulf countries and Algeria, meanwhile, also have a much larger public sector payroll, a longstanding element of the social contract between policymakers and their citizens. Artificially low domestic energy prices are also being targeted by policymakers. Government regulations ensuring inexpensive fuel, water, and electricity have traditionally been another part of the social contract. Therefore, the reform of these subsidies (that had tended to benefit the well-off) is welcome evidence of a sea change in the policies of the oil exporters. Oman, the United Arab Emirates, and, more recently, Qatar have gone one step further by introducing automatic pricing, whereby local energy prices adjust in tandem with international benchmarks. The challenge for policymakers across the region will be to move energy prices toward international levels in a way that minimizes the adverse social impact; for example, through targeted transfers to the vulnerable segments of population. 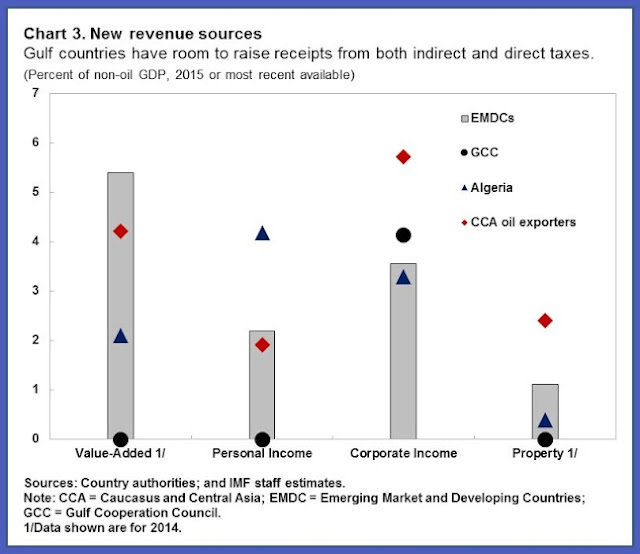 Spending control is only part of the fiscal equation for oil exporters, however. 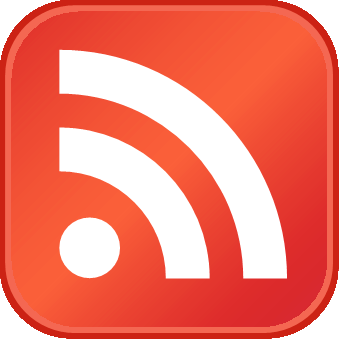 Another important consideration is finding new sources of revenue. A number of promising plans are emerging, especially the discussions of Gulf countries to introduce a value-added tax (VAT). This would be a major achievement for a region that has traditionally relied mostly on hydrocarbon-linked receipts. 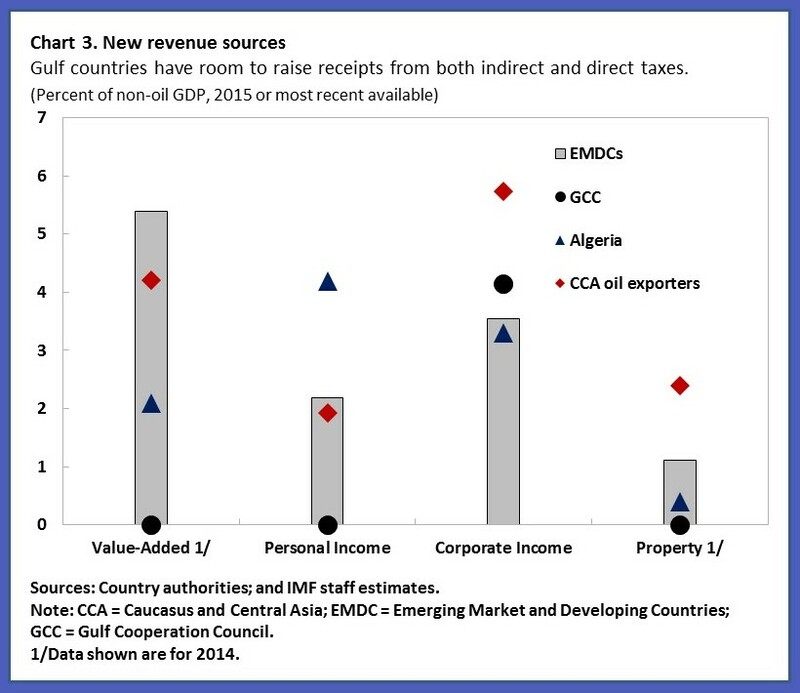 In parallel, some Gulf countries have been raising fees, excises, and corporate income taxes. In the Central Asian oil exporters, non-oil taxation is much more developed, but there is room to reduce exemptions and strengthen collections (Chart 3). 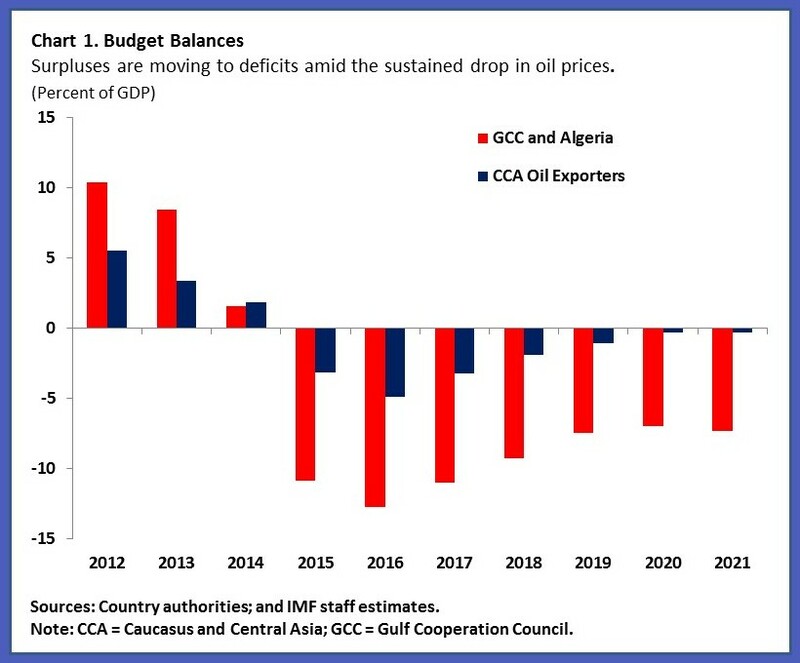 Central Asian oil exporters have achieved some fiscal adjustment indirectly, by allowing their exchange rates to depreciate. This has raised the local-currency value of their export receipts and related taxes. However, these fiscal gains will only last if fiscal expenditures, in particular public wages, do not increase in tandem with the exchange rate depreciation. Currency adjustment in these economies has also brought some undesired side effects, including inflationary pressures and concerns about stability of the highly-dollarized financial systems. Therefore, the Central Asian oil exporters also face the challenge of strengthening their monetary, exchange rate, and financial sector policy frameworks. 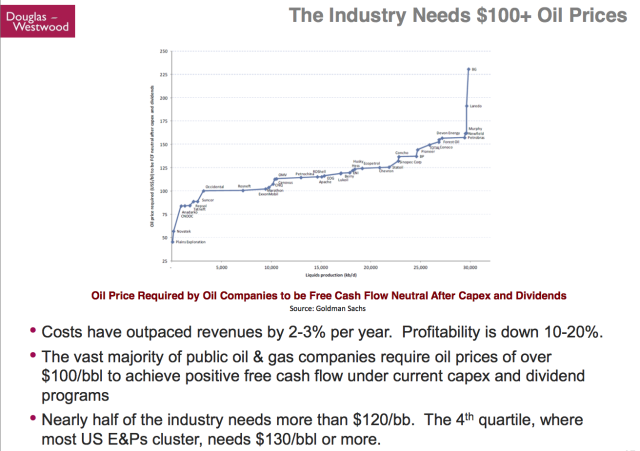 In the coming years, oil revenues will no longer be sufficient for governments to act as the main employer of their fast-growing young populations. Therefore, policymakers must find new ways to promote private sector development and help their economies diversify away from oil. The Gulf countries already benefit from high-quality infrastructure, but are hindered by bureaucracy and lingering gaps in their legal and regulatory frameworks. They could also further improve the quality of education. 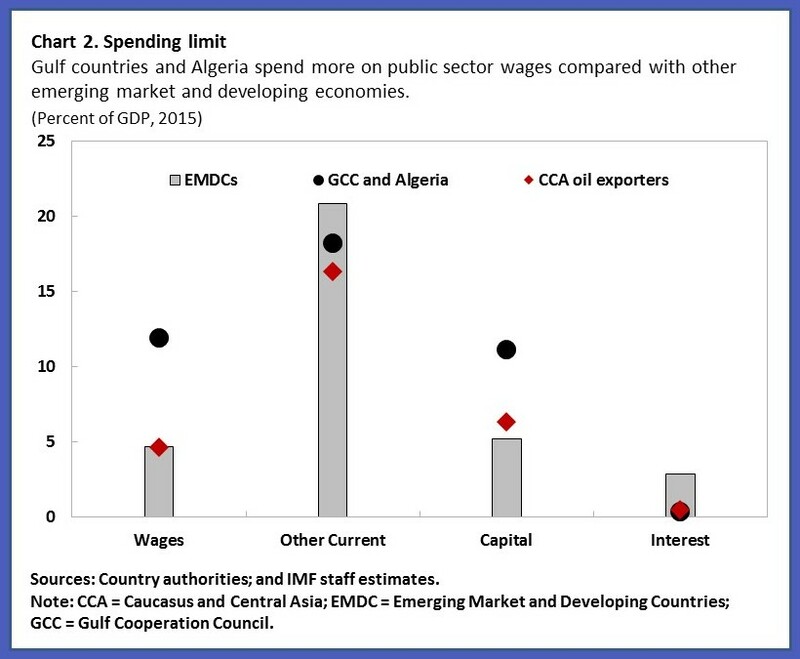 Institutional quality could be enhanced in Central Asian oil-exporting countries and Algeria in a number of areas, including contract enforcement, corruption, and access to finance.